“many existing commercial killing methods expose fish to substantial suffering over a prolonged period of time”. Eels are immersed in salt and gutted while many are likely to still be alive. The EU’s AHAW panel of scientists has reported, for example, that turbot are not stunned prior to slaughter under commercial farming conditions and the most common method for killing turbot is asphyxia on ice. Turbot lying at the bottom can be subjected to considerable pressure due to the weight of ice and fish until death occurs and this may cause further pain and distress. In the commercial method of slaughtering carp, the fish are removed from water for a period of up to 20 minutes or longer before being percussively stunned with a priest. spiking combined with food-grade fish sedatives (licensed for use in New Zealand, Australia and Chile). To achieve humane slaughter these methods must be properly designed for the species in question and effectively carried out. Common carp (Cyprinus carpio). An estimated 26-132 million farmed common carp are killed for food each year in the EU and 1,378-6,888 million globally. Most are likely to be killed using inhumane methods. Many carp farmed in the EU are sold alive. Fish slaughtered at home may suffer prolonged transport without water, asphyxia, temperature shock, excessive handling, and ineffective stunning. The following YouTube footage shows carp being sold live at a market in Minsk, Belarus. Most of the world’s farmed fish are reared in Asia where the transport, handling and killing of fish usually does not conform to the World Organisation for Animal Health’s (OIE) fish welfare guidelines3, 4 & 5. 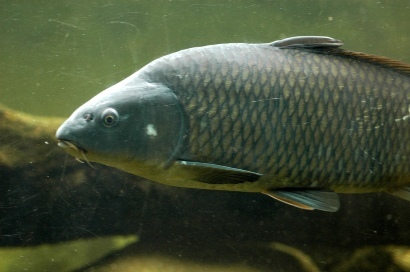 Crucian carp (globally probably the most numerous farmed species (see study to estimate of numbers of farmed fish)) is sold “entirely live or fresh”, grass carp are normally sold live or fresh and silver carp are normally bought live, according to the FAO. The following youtube footage shows the commercial processing of live pagasius catfish in Vietnam. The fish are bled to death by cutting one of the gills, without prior stunning. This does not cause immediate loss of consciousness, and the pain and distress caused is likely to last several minutes. African catfish, for example, have been shown to remain conscious more than 10 minutes after cutting, while some fish take even longer for loss of consciousness and death1. Turbot have been shown to take 1-1.5 hours to die after cutting1. Note also that cutting only one of the gills, and not both, will result in a slower bleed-out and a slower death, prolonging the distress further. Prior to gill-cutting, the pangasius have experienced removal from water for some time, storage in baskets (fish piled on top of each other) and rough handling by the conveyor belt machinery. The fish arrive at the abbattoir in baskets. They will be distressed by being out of water and compressed under the weight of other fish. The baskets of live fish are emptied down a chute, the fish drop onto a conveyor belt which later drops them down a slide. The fish are still gasping and clearly still conscious when they are manually bled by cutting one of the gills. The fish slide into water to bleed out, are carried along another conveyor belt, then dropped onto another. There are occasional tail movements as the fish arrive to be filleted by hand. A ban on the use of carbon dioxide stunning throughout Norway came into effect in January 2010, by which time, 80% of fish abattoirs had installed either percussive or electrical stunning equipment. In the UK, all key supermarkets have reportedly adopted humane slaughter standards for salmon and trout. The Soil Association, RSPCA Freedom Food and Code of Good Practice for Scottish Finfish Aquaculture (CoGP) UK farm assurance schemes covering fish all require humane slaughter methods to be used. Under EU legislation, fish are included in the general minimum standards for farm animal slaughter (Council Directive 1099/2009 and 93/119/EC, which it replaces in 2013) but these contain no detail on permissible killing methods. Specific requirements on permissible killing methods for fish need to be introduced to prevent further widespread suffering. A recent paper published in Fish Physiology and Biochemistry provides a short overview on the welfare of farmed fish at harvest and argues that, for most species, this could be improved by adopting and adapting existing procedures6. 1. Opinion of the Scientific Panel on Animal Health and Welfare on a request from the Commission related to welfare aspects of the main systems of stunning and killing the main commercial species of animals, The EFSA Journal (2004), 45, 1-29. http://www.efsa.europa.eu/en/efsajournal/pub/45.htm. 2a. Scientific Opinion of the Panel on Animal Health and Welfare on a request from the European Commission on Species-specific welfare aspects of the main systems of stunning and killing of farmed rainbow trout. The EFSA Journal (2009) 1013, 1-55. Accessed on 2012 May 9 at http://www.efsa.europa.eu/en/efsajournal/pub/1012.htm. 2b. Scientific Opinion of the Panel on Animal Health and Welfare on a request from the European Commission on Species-specific welfare aspects of the main systems of stunning and killing of farmed Atlantic salmon. The EFSA Journal (2009) 1012, 1-77. http://www.efsa.europa.eu/en/efsajournal/pub/1011.htm. 2c. Scientific Opinion of the Panel on Animal Health and Welfare on a request from the European Commission on Species-specific welfare aspects of the main systems of stunning and killing of farmed carp. The EFSA Journal (2009) 1013, 1-37. http://www.efsa.europa.eu/en/efsajournal/pub/1013.htm. 2d. Scientific Opinion of the Panel on Animal Health and Welfare on a request from the European Commission on welfare aspect of the main systems of stunning and killing of farmed eel (Anguilla anguilla). The EFSA Journal (2009) 1014, 1-42. http://www.efsa.europa.eu/en/efsajournal/pub/1014.htm. 2e. Scientific Opinion of the Panel on Animal Health and Welfare on a request from the European Commission on welfare aspect of the main systems of stunning and killing of farmed seabass and seabream. The EFSA Journal (2009) 1010, 1-52. http://www.efsa.europa.eu/en/efsajournal/pub/1010.htm. 2f. Scientific Opinion of the Panel on Animal Health and Welfare on a request from the European Commission on welfare aspect of the main systems of stunning and killing of farmed turbot. The EFSA Journal (2009) 1073, 1-34. http://www.efsa.europa.eu/en/efsajournal/pub/1073.htm. 2g. Scientific Opinion of the Panel on Animal Health and Welfare on a request from the European Commission on the species-specific welfare aspects of the main systems of stunning and killing of farmed tuna. The EFSA Journal (2009) 1072, 1-53. http://www.efsa.europa.eu/en/efsajournal/pub/1072.htm. 3. Chapter 7.1. Introduction to recommendations for the welfare of farmed fish. 2010 OIE Aquatic Animal Health Code. http://web.oie.int/eng/normes/fcode/en_chapitre_1.7.1.pdf. 4. Chapter 7.2. Welfare of farmed fish during transport. http://web.oie.int/eng/normes/fcode/en_chapitre_1.7.2.pdf. 5. Chapter 7.3. Welfare aspects of stunning and killing of farmed fish for human consumption. http://web.oie.int/eng/normes/fcode/en_chapitre_1.7.3.pdf. 6. Lines, J.A. and Spence, J., 2012. Safeguarding the welfare of farmed fish at harvest. Fish Physiology and Biochemistry. Volume 38, Number 1 (2012), 153-162, DOI: 10.1007/s10695-011-9561-5.